So many of us are willing to pay out-of-pocket for beauty products, cosmetic enhancements, expensive accessories. But when it comes to our health and wellbeing, we expect someone else to foot the bill. Stress and poor nutrition take a major toll on health and beauty and cannot be overridden by external enhancements and exercise. Only by investing in your inner health and a balanced wellbeing can you achieve true beauty and vibrancy. Increasingly, insurers are offering plans with larger deductibles that shift costs onto the patient when illness strikes. This results in larger out of pocket expense for patients who ultimately can only use their policies for catastrophic event coverage. Dr. Skye believes in a proactive, accessible wellness model for patients. Dr. LaChute does not contract directly with insurance providers. She offers a traditional “fee for service” model, as well as direct care wellness options to make care affordable and accessible to all patients. This allows her to spend maximum time working with and for patients, personalizing the visit and treatment rather that following the dictates of insurance which restricts time and types of treatments. Upon request, we provide a superbill that allows you to file directly for out of network reimbursement if your plan offers this option. Services can be paid with your employer-sponsored Health Savings Account (HSA) or Flexible Spending Account (FSA). Check your HSA and FSA plan details for instructions to access those funds for reimbursement. These plans give you the greatest flexibility for spending healthcare associated funds before dealing with your insurance plan. Wellness Basic is for those with relatively stable health who are looking for a comprehensive visit annually. The plan provides a couple follow up visits for acute illness, for working on simple problems or for receiving additional therapies throughout the year. Should your care needs rise above what's included in the Wellness Basic Plan, any additional services receive a 20% discount from the standard fee schedule, with 10% off medicinary items for the year your plan is active. 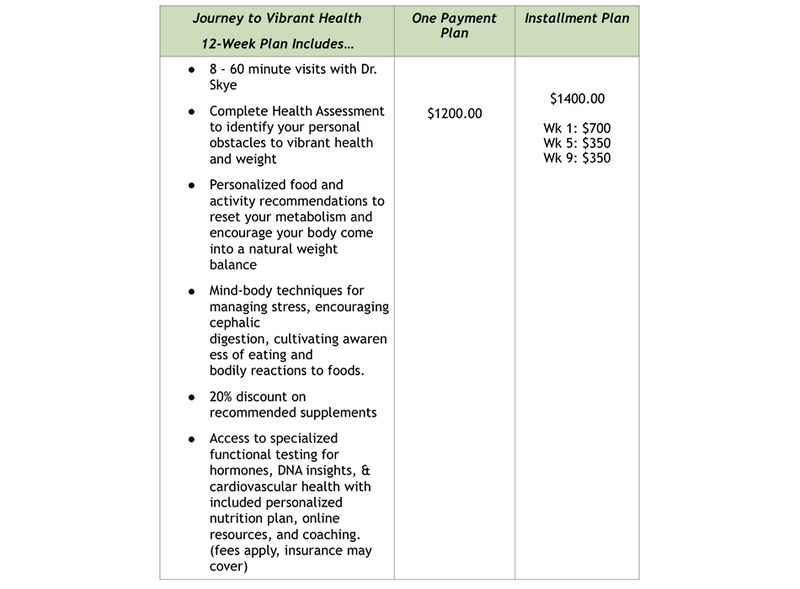 The Wellness Basic Plan saves you 10-15% off the normal office visit fee schedule, depending on the payment plan you choose below. Wellness Comprehensive is for those with more complex or chronic healthcare needs. Your initial visit includes a comprehensive annual exam, labs, and a stress evaluation. During this visit, you'll discuss your wellness goals and schedule your follow up visit to review lab results and discuss your wellness plan for the year. As part of the plan, you receive additional visits for acute illness and ongoing monitoring of complex conditions, email access to the doctor, and priority scheduling with early/late hours as needed to accommodate your schedule. All medicinary items through our pharmacy are 20% off and additional services beyond what is included in your plan are 30% off for the year your plan is active. 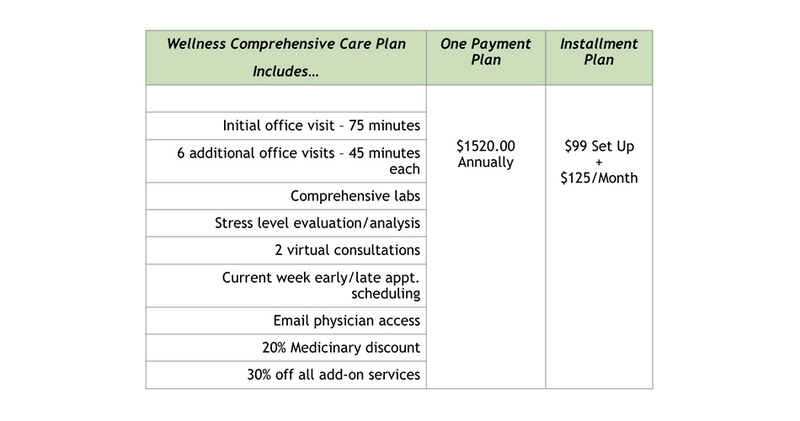 Wellness Comprehensive Care saves you 15-20% off the normal office visit fee schedule, depending on the payment plan you choose below. Fad diets. Weight loss schemes. Superfoods. Demonized foods. Jumping on the bandwagon of these trends often doesn't have a lasting effect because the body is a complex & dynamic system of nerve impulses, hormone, & neurotransmitters that drive cravings, hunger, satiety & weight. The key is changing our relationship to food & what our body wants - not bouncing around cycles of deprivation & excess. It's not a matter of willpower, but balance and biochemistry. You can learn how to have a different relationship to food and your body. Dr Skye is offers a personalized, 12-week cycle of cultivating healthy eating habits using "real" food, balancing metabolism, with weight & stress management. Standard laboratory diagnostic tests such as metabolic panels, blood counts and thyroid function, are covered by most insurance providers. When we order those tests, the lab will bill your provider directly. Some specialty laboratory diagnostics (allergy testing, adrenal panels) may not be covered by insurance. Our Wellness Plans have a lab allowance that can be used to order specialized tests or basic labs. Cancellations must be made within 24 hours prior to appointment time or could result in a $50 cancellation fee. For referrals resulting in a New Patient appointment and visit, we provide a 50% reduction on the referrer’s next visit. 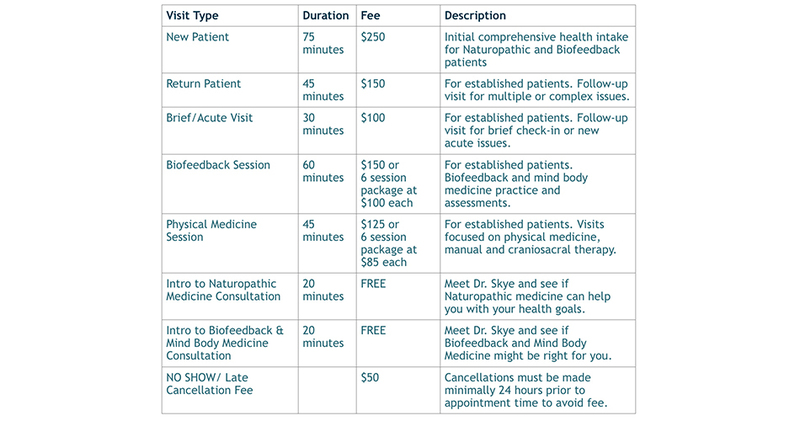 Dr. Skye has a limited number of openings in her schedule to support sliding scale, student and senior discounts. Please schedule a complimentary visit to discuss options and availability. Integral Natural Medicine has an offering of supplements in our office and through the Online Virtual Dispensary. These products have been carefully selected for quality control and are professional grade in therapeutic doses. We select products that are manufactured under the FDA’s standard for Good Manufacturing Practices (GMP) to ensure product safety. By carrying these products, in office and online, we make it convenient for patients. At no time is any patient required to purchase supplements from Dr. Skye. She will discuss her suggestions and the benefits of any recommendations to enable patients to make an informed choice.